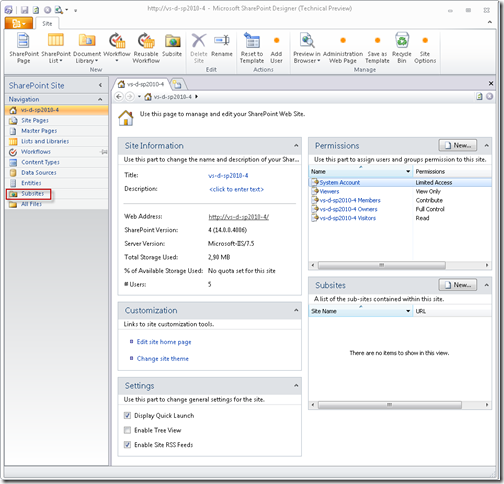 My second article on using WPF from PowerShell. You can download WPK as part of the Windows 7 Resource Kit PowerShell Pack. When you can navigate to the folder <My Documents>\WindowsPowerShell\Modules you see the modules that are installed. The folder WPK contains the WPK module. I thought James Brundage is an employee of Microsoft, why does he own portions of the copyright? So no support from Microsoft’s side. I wonder how issues will be resolved and new releases will be published. Ok, and now on to some programming. In the document Writing User Interfaces with WPK.docx we find a nice example of a process viewer that updates the list of processes every 15 seconds. See the document for a great explanation on how it works. What if I don’t want to do a timed update, but just bind to some existing data? All examples do the data collection in the Get-PowerShellDataSource script block, is it possible to have the data already somewhere in a variable? Can I skip the binding stuff, I know its really powerful, but I want to start simple? Retrieve data in a background job is really cool, but what if we just want to load data and go? I still use binding to the output, and in the datacontext script block I write the elements to bind to to the output. I still don’t bind to pre-calculated data in a variable. In the above code I create a variable with a list of objects with two properties, Name and Age, and bind the ItemsSource property of the ListView to this variable. I bind the data in the Loaded event, the complete control tree is in place when this event fires. I have named the ListView control ‘mylistview’, and with the code in line 24 I can find the control by name. The $window variable points to the implicitly created Window control surrounding the ListView, and is always available. Diving into this simplification kept me busy for a while and gave me as a WPF nono some insights in how things are working in WPF when doing this from PowerShell. 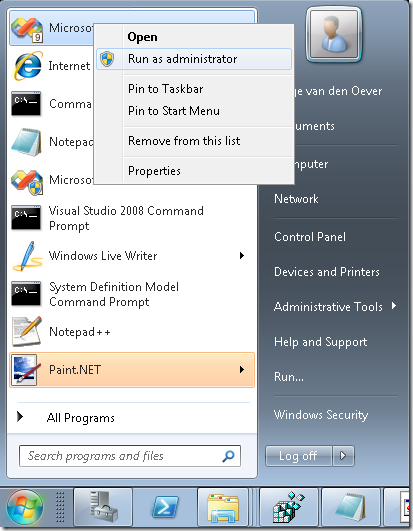 My first article on using WPF from PowerShell. What is WPK? Were can you get it? How to get started? I have been programming in PowerShell since 2006. At Macaw we use PowerShell for most of the development on the Macaw Solutions Factory. I have written thousands and thousands of lines of code in PowerShell 1.0. Some of the GUI tools in the Macaw Solutions Factory are even written completely in PowerShell. We use PrimalForms for the generation of the PowerShell code to render the GUI. 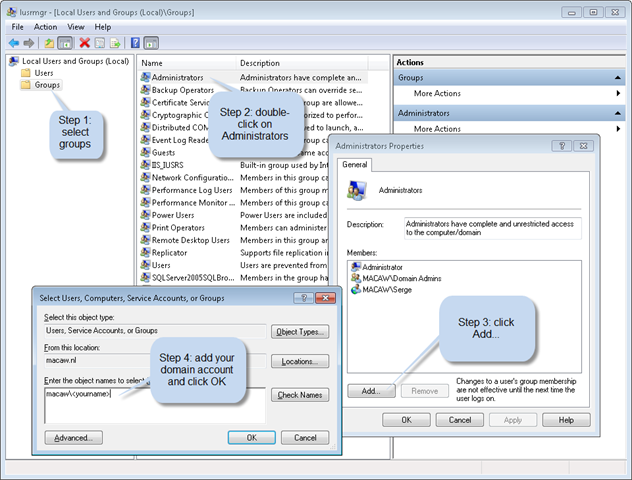 PrimalForms: PrimalForms Community Edition is a free GUI builder tool for PowerShell users. 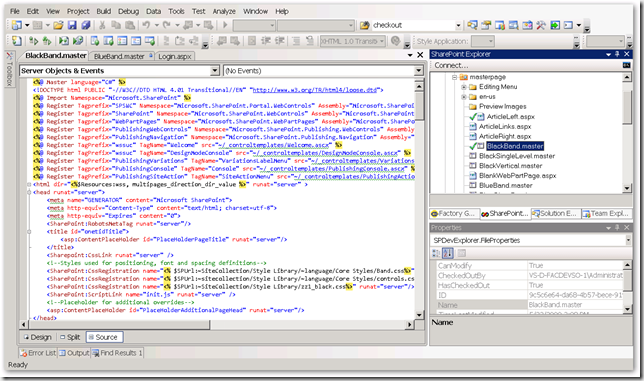 It edits and stores Windows Forms in a native XML format and generates PowerShell code on demand. Sample forms included. 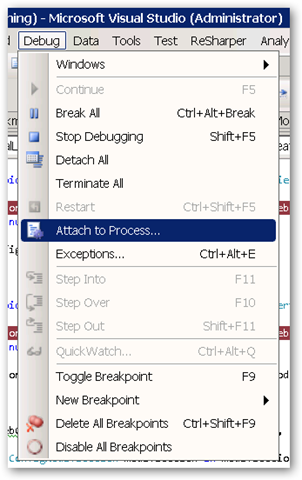 More complex GUI tools are written in standard C#/WinForms. I prefer to have the tools in the Macaw Solutions Factory to be written completely in PowerShell. The reason is that most innovations to the Macaw Solutions Factory are done in real world projects. Because the Macaw Solutions Factory almost completely consists of script code, it is possible to add new features on any development machine that checked out the Factory code together with the source code of the project. No special development environment is needed. Good innovations are merged into the trunk of the Factory. Also fixing issues or making project specific modifications is a breeze. Enter WPF! I have been playing with WPF and PowerShell a few years ago. Problem was that PowerShell had to be executed in a Single Threaded Apartment (STA) instead of the default Multi Threaded Apartment (MTA). My first discussion on this with Bruce Payette never resulted into a good working solution. A few days ago I ran across an interesting project at CodePlex: PowerBoots. 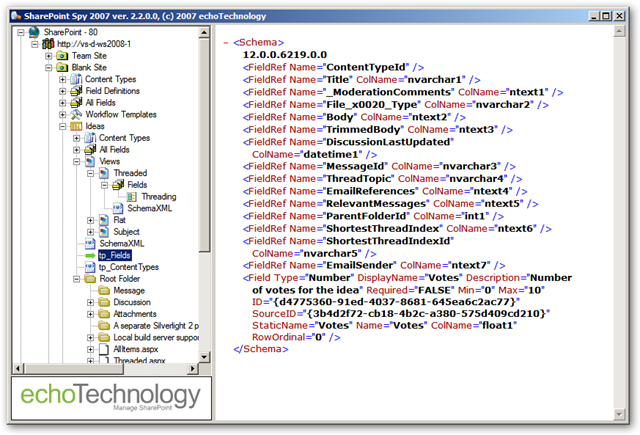 This tooling provides WPF from both PowerShell 1.0 and PowerShell 2.0. I did some tests with it, and had some trouble, partly due to complete lack of knowledge of WPF. While searching the web I also stumbled upon WPK, the Windows Presentation Foundation PowerShell Kit. It is part of the just released Windows 7 Resource Kit PowerShell Pack (most things work on any OS with PowerShell 2.0 installed). WPK takes a very similar approach as PowerBoots. Check them both out! It is Christmas time. This means: two weeks no real company work, a bit of free time to dive into something new. I have been running around the last three days in PowerBoots and WPK, and I must say: the demo’s look great and most of them work, but even the most simple baby steps completely fail on me, especially due to my complete ignorance of what happened in the WPF space for the last years. Yes, I am ashamed of myself. Time to catch up… baby steps at a time. There are actually two things to dive into: the new features of PowerShell 2.0 and WPK. So don’t expect much of the next posts, it is all really basic stuff, but I see on my blog that the baby step posts are the most popular posts. Posts like how to call a PowerShell function with arguments (fn –arg1 a –arg2 b instead of fn(a,b)). So expect some post at this level… is just write down the things I go through myself. To get yourself started on the possibilities of WPK, have a look at the WPK video’s available on Channel 9. James Brundage, part of the Microsoft PowerShell Test team, does a good job on explaining WPK. There are a few videos there now, with more to come. For questions have a look at the discussion thread on the PowerShellPack site. When I was at the SharePoint Conference 2009 in Vegas I was sitting in the hallway working on my little white Mac Book writing a blog post on SharePoint 2010 when a guy passed by. “Can I ask you some questions?” “Sure”, I said. “If I did anything with SharePoint?” he asked me… Ok, sitting with a Mac on a Microsoft conference can be strange, but hey: VMware Fusion did let me run the Technical Preview of SharePoint 2010 on my little Mac Book with 4GB, which couldn’t be said of my Dell running Windows XP at the time, not supporting 64 bits virtualization with Microsoft tools. We talked for a few minutes, he made some audio recordings, and off he was. This link is provided by Microsoft The Netherlands to a group of people called the “Wave 14” ambassadors. We have a small competition between the ambassadors: the one who gets the most clicks gets an XBox!! So help me out, click it… often! 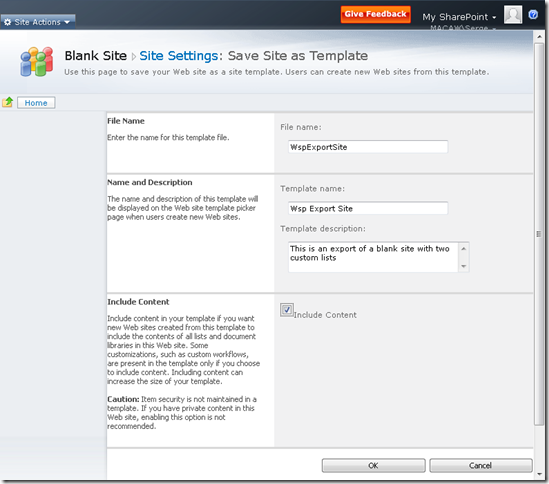 And I will make sure that I blog a lot about SharePoint 2010! An old Dutch phrase… translated into bad English! 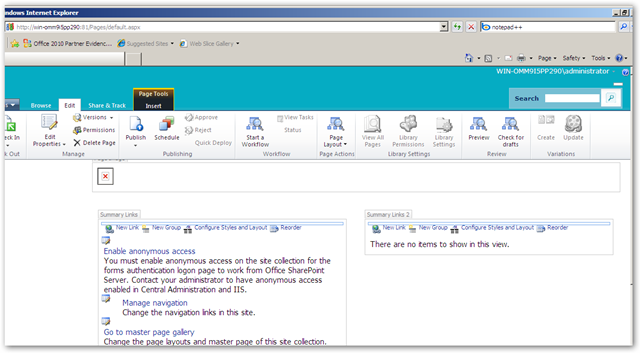 But it is going to happen: the first public beta of the Office tools… including: SharePoint 2010! 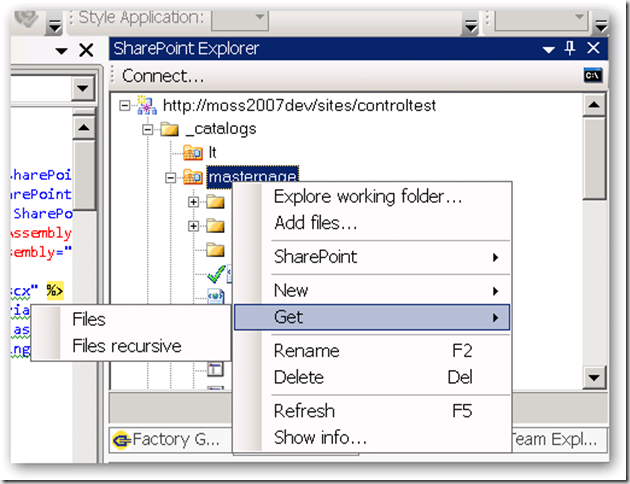 SharePoint 2010: #SPC09 - SSP is dead, long live Service Applications! 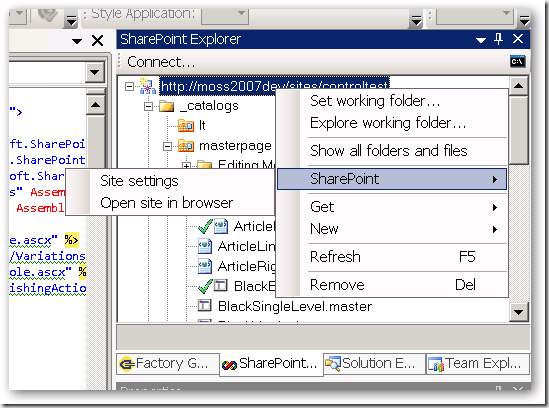 In SharePoint 2010 Shared Service Providers (SSP's) are replaced by Service Applications. Services are no longer combined into a SSP. Services are running independent as a service application. SSP: combines services like Search, Excel Services, User Profiles, ... into a shared service provider. Service Applications: services like Search, Managed Meta Data, .., your service (20 services in SharePoint Server) are running "unboxed" and independent. 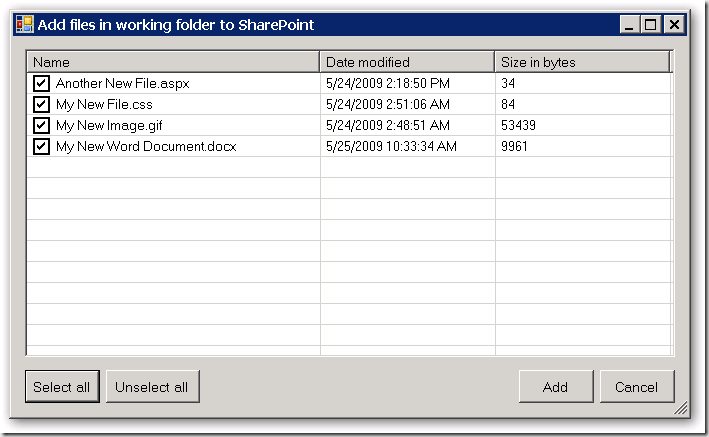 So SharePoint 2010 provides a la carte unboxed services. 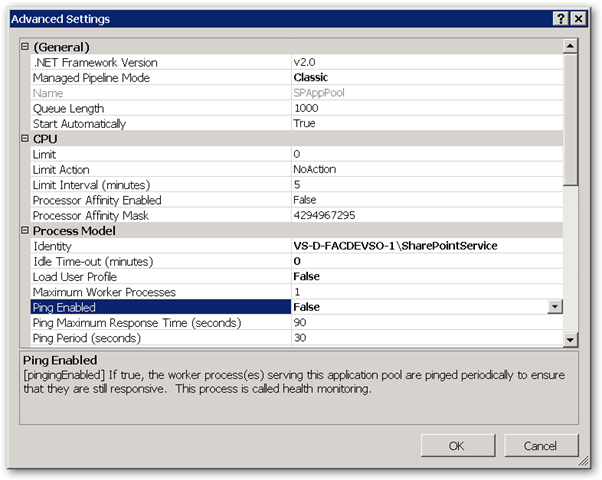 You can configure which services are running on an application server. Per web application you can configure which services are consumed. 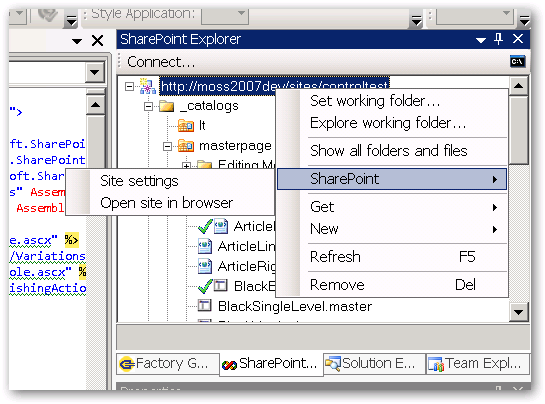 When migrating MOSS 2007 to SharePoint 2010 SSPs will upgrade into Service Applications. 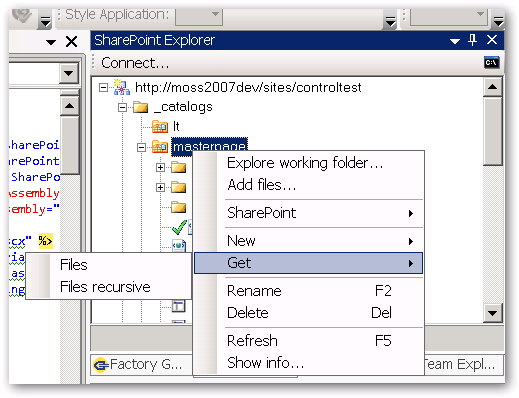 SharePoint Foundation 2010 (WSS 4.0) provides the SharePoint Service Application Framework. New products like Office Web Apps, Project Server, Gemini (PowerPivot) use this application framework, and this platform can also be used by third parties or you to create custom services. You can plug your management UI for your service into the Service Management page. 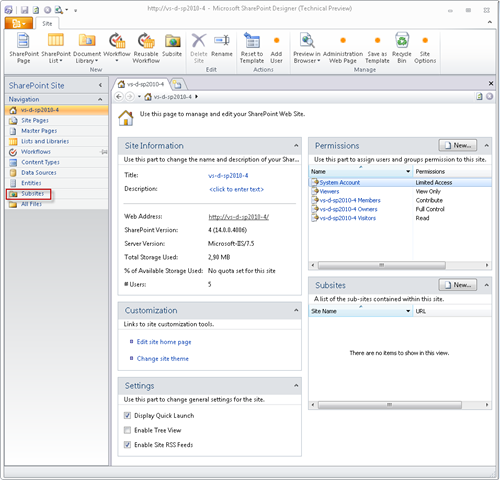 SharePoint 2010 does contain a fault tolerant round-robin software load balancer with support for hardware load balancing, so it is possible to have multiple application servers. For example: Taxonomy, has cross farm federation. Probably same for content types? You can manage which services are running on a server. In Central Administration UI: list of services, indented under a service you see the proxy. Through the wizards you get database names with guids at the end. 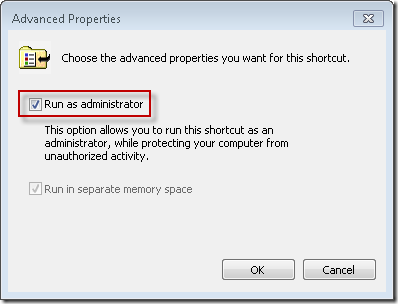 Better to create manually form Central Administration, or create services through PowerShell. Per web application you can configure which services apps you want to be available. By default all web applications use all service applications available. You can change this into a custom configuration. Use the Manage Service Associations page for this. The other farm can connect to your farm through a remote service connection. 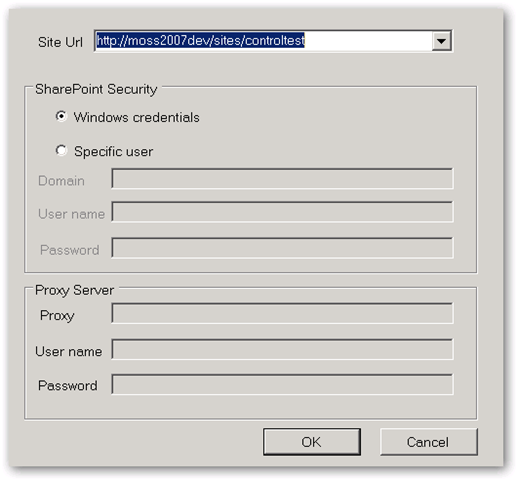 Although manual adminstration and configuration of SharePoint 2010 can be done through Central Admin, the future of SharePoint administration is PowerShell. 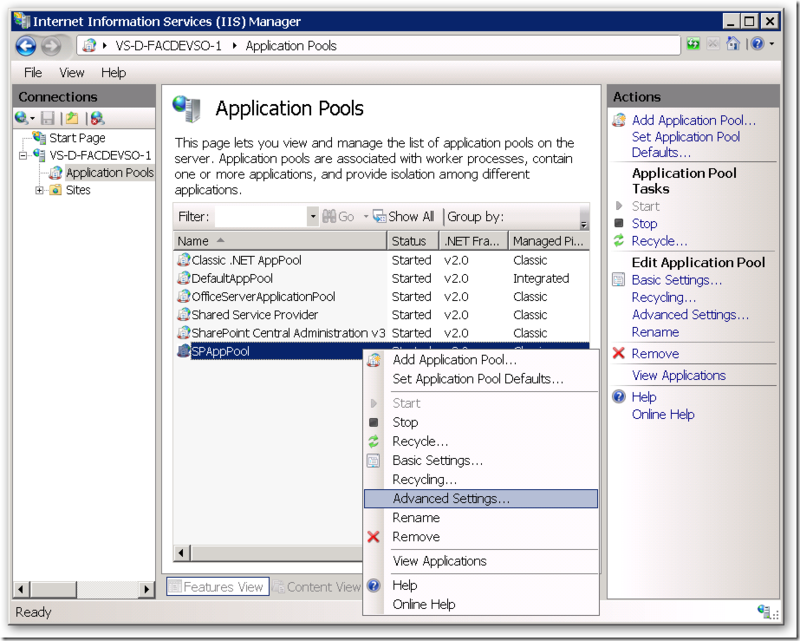 Get-SPServiceApplication returns the set of service applications. 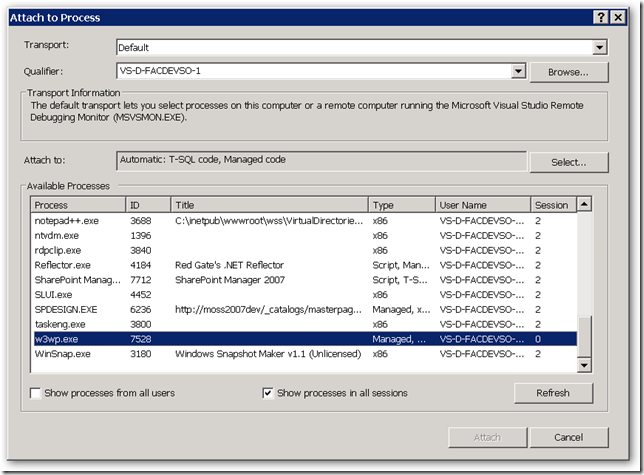 Do Get-SPServiceApplication-name yourservice to get the service object. Do Get-SPServiceApplication -name yourservice | fl to see all properties of the service object. There are almost a hundred Cmdlets to manage your services. Side note: It now really becomes time that all administrators learn PowerShell. In my company (Macaw) we use PowerShell extensively for our Macaw Solutions Factory. Everything from configuration, build and deploy through DTAP is done with PowerShell. It is possible to delegate management of a particular service to someone, that person then has only access to that the management UI in Central Administration for that particular service. Access security: specified claims principals have access to a service application. 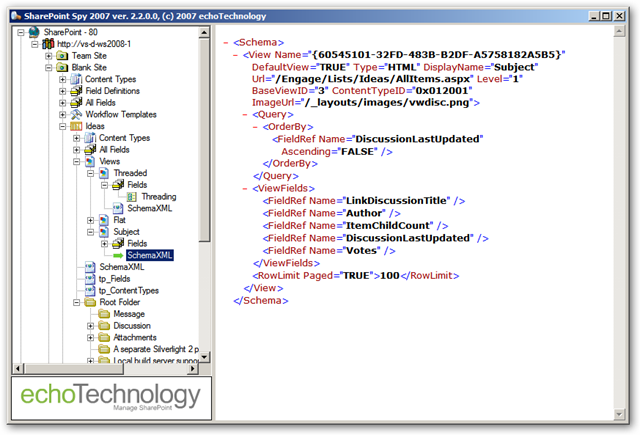 By default the "farm claim" has access, but this can be removed ad more detailed claims can be configured for more granular access rights, or example read versus read-write. Service applications can spawn their own timer jobs. Generally ISV's will build service applications on the SharePoint Service Application Framework, but for large organizations it could be interesting for SI's to create services to specialized functionality and farm-to-farm fedaration . 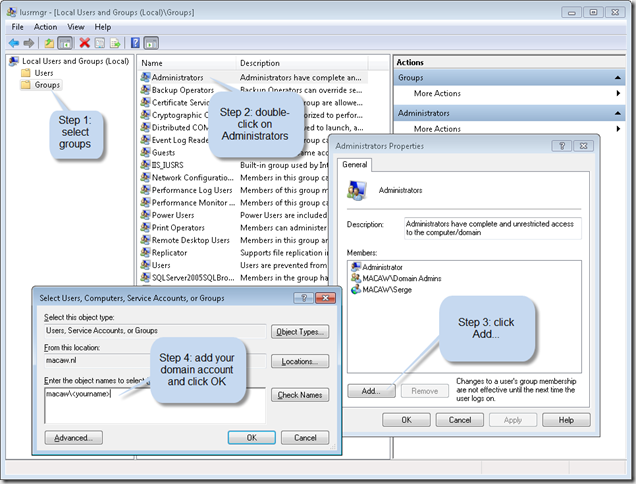 For repeatable configuration over your DTAP configuration, use PowerShell to create and manage the services. You can create complex farm configurations where farms can share service applications. For example: two farms can share the user profile service. Never knew this: you can have multiple startup projects in a solution. 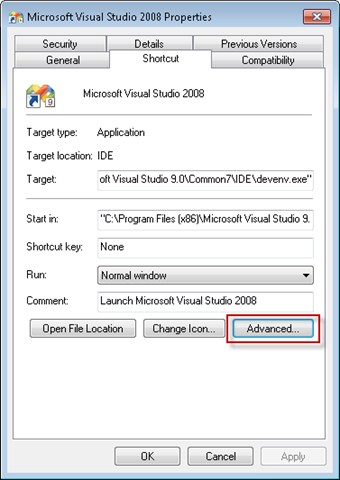 Was there already in Visual Studio 2005! See http://msdn.microsoft.com/en-us/library/ms165413%28VS.80%29.aspx for more info. 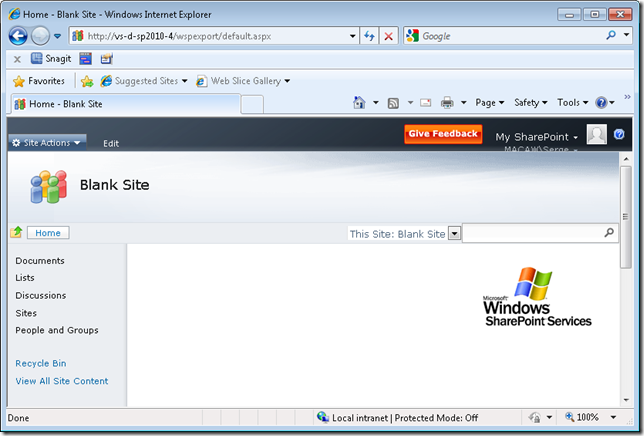 Note: this blog post is based on experiences with the SharePoint 2010 Technical Preview version. Now I understand why some of the code is not that readable: it is generated code. Script# is used for creating the client side object model API! Have a look at http://projects.nikhilk.net/ScriptSharp for more info on Script#. I never dared to use Script# i a real project going into production, especially because the last version came out in August 2008. But Microsoft does not seem to have a problem with it. The Microsoft team is even running an older version that available for download (version 0.5.1.0). As far as I know the Office Web Applications (online Word, Access and PowerPoint) are written with Script# as well. See http://www.nikhilk.net/ScriptSharp-Large-Projects.aspx. So maybe it is time now to really dive into Script#! Anyone dare to it for production code in their projects already? 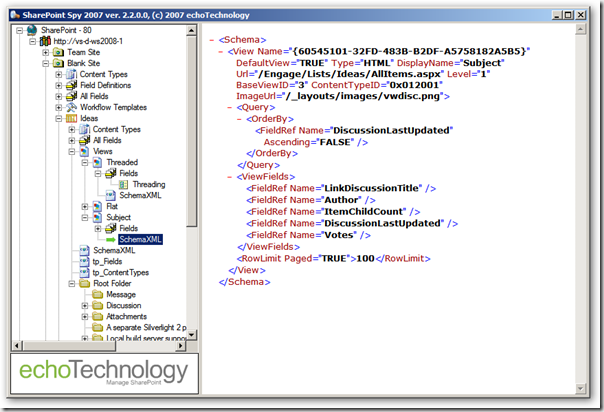 Note: this blog post is based onexperiences with the SharePoint 2010 Technical Preview version. 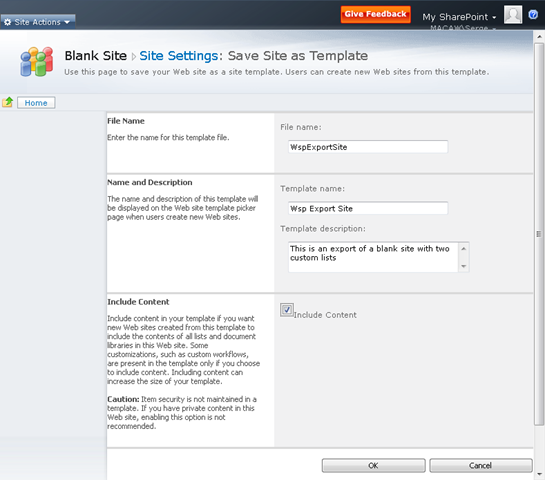 In the good old days of SharePoint 2003 and 2007 it was possible to save a site as a template. These sites were saved as .stp files, I assume this acronym stands for SiteTemPlate, a non-documented closed format that did not allow for modification in the saved template files. so new sites could be created based on the template. 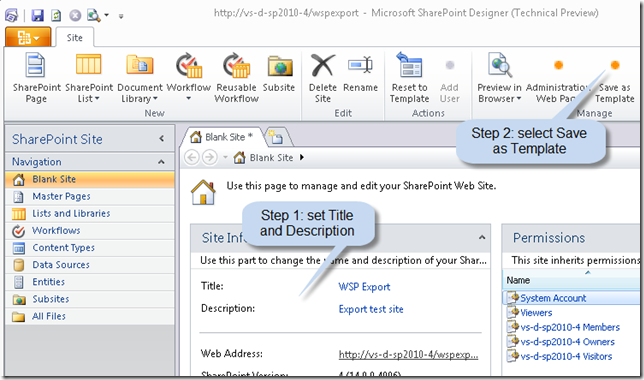 SharePoint 2010 promises the possibility to save a site as a WSP package, the Windows SharePoint Services Package format that we all love in the development of our SharePoint solutions, because it promises seamless deployments through the farm. Is the site really exported as a WSP? And how does it look like at the inside? If we create a new site based on the template, do changes to content types at the site collection level propagate to the content types in the new instance of the site template? In Moss2007 it was not possible to export a publishing site as a site template. Well, actually you could, but it was not supported. Probably because pages and content a site publishing site depends on, like master pages, pages layouts, the style library and site collection images are managed at the site collection level (in the root site of the site collection). Did this change in 2010, and how is it handled? What is exported. The complete configuration of the site, or only changes to the site with respect to the initial site definition? 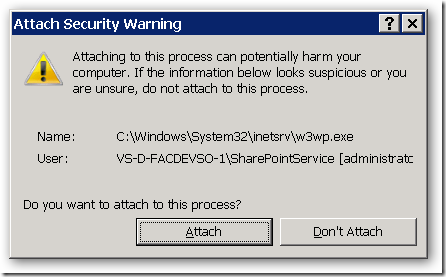 Can we learn some new stuff on authoring WSP’s from the generated WSP’s? 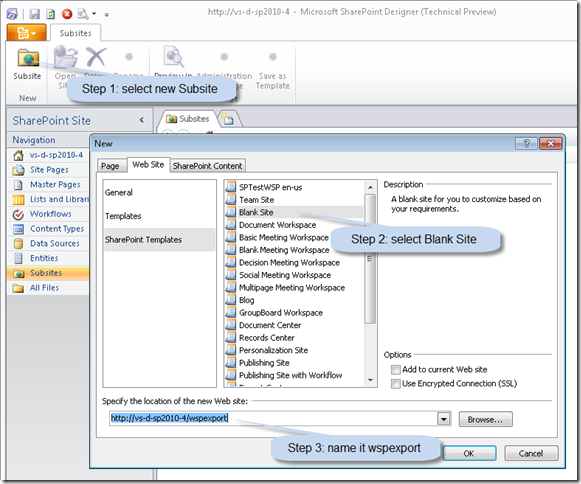 Visual Studio SharePoint Support has a project type “Import SharePoint Solution Package”, what does that do? Can we use the WSP generated by a saved site template? 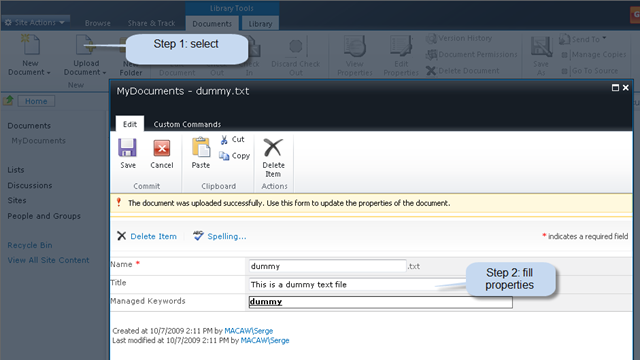 To inspect some of the export functionality we create a custom list MyList with a Title and Description field, and a document library MyDocuments. We put some entries in the custom list and add a document to the document library. I assume that everyone knowing something about SharePoint knows how to do this. Following the user solution gallery will bring us to the Solution Gallery. This is a location where solutions can be uploaded and downloaded. These solutions can probably be solutions that can include code that will be run in a sandbox. More on this in an upcomming blog post. Right-click on the WspExportSite and select Save Target As… to save the WSP file to your location of choice. 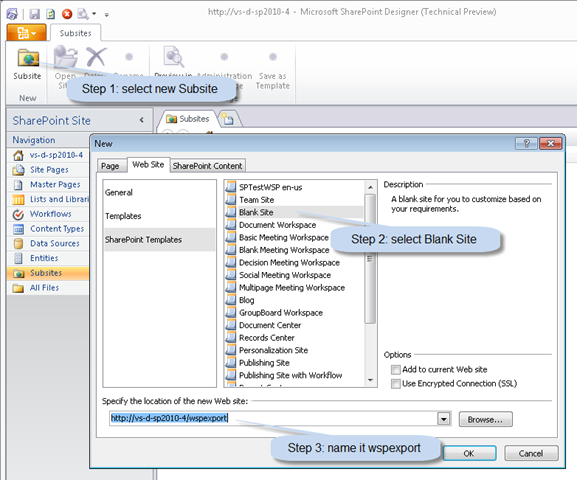 Note: this post is only relevant for people running the SharePoint 2010 Technology Preview. 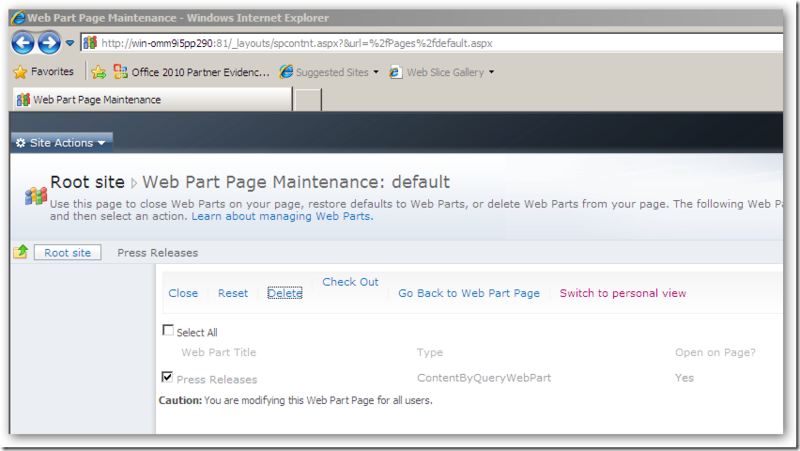 Check Out the page, remove the web part (Delete, not Close), and your page starts working again. After a single machine SharePoint 2010 install using the built in SQL Server Express my machine became really sloooooooow. After checking the processes it became clear that SQL server was eating memory. This is the default behavior of SQL Server. I tried to install the SQL Server 2008 Manager Express, but the installation failed. The SQL Server Express provided with SharePoint 2010 seems to be a newer version than the SQL Server 2008 Express version. After a long search on the internet I finally found how to set the memory limits for a SQL Server instance through osql.exe. First thing to do is to determine which instance you want to limit. 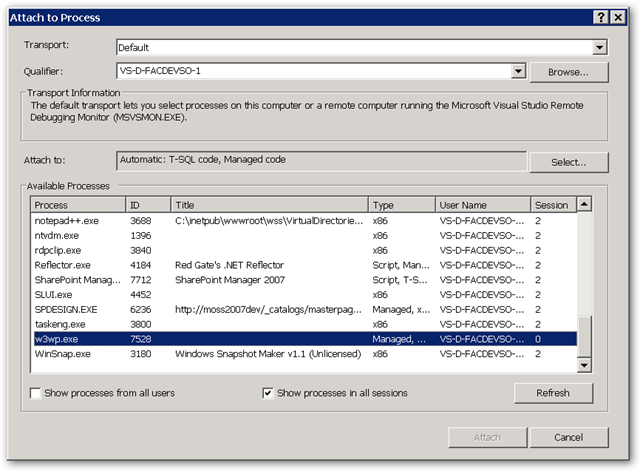 One way of doing this is by finding the process ID using the built in Task Manager, and then use the Sysinternals Process Explorer to determining what instance is running under that process ID. 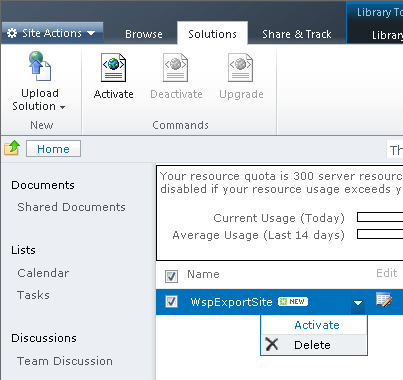 On my machine .\SHAREPOINT was good enough for connecting to the SQL Server instance used by SharePoint. 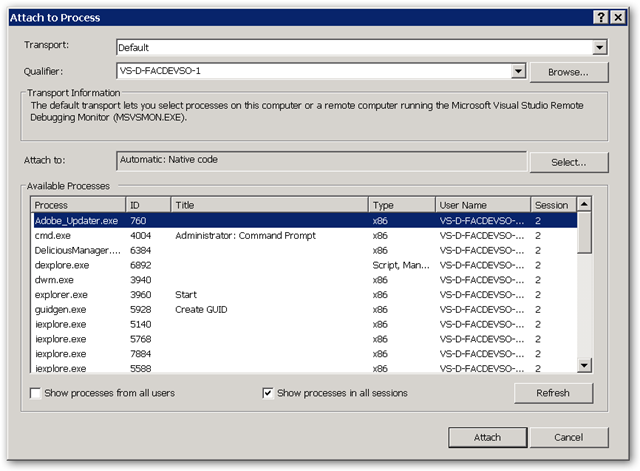 The problem is: I forget to do this all the time, and I ALWAYS want to run Visual Studio as an administrator. This will work on any program, and on any OS with user access control (Vista, Windows 7, …). In order to be able to do this you must be added to the Administrators group on the local machine. If you don’t have the permissions to do this, login with an account that has enough permissions, or login with the local administrator account. When you start up Visual Studio you will always get a warning from User Access Control with the question if you want to allow the program to make changes to your computer. Don’t know if you can prevent this popup. Microsoft has great virtual labs available, but it takes some time to get in there. If you just want the lab notes, type the following in Google: site:download.microsoftvirtuallabs.com filetype:pdf or just follow this link. 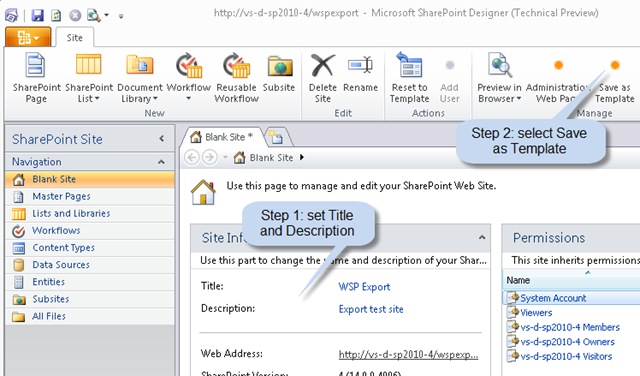 SharePoint has a great way for deploying content and functionality using Windows SharePoint Services Solution Packages (WSP's). 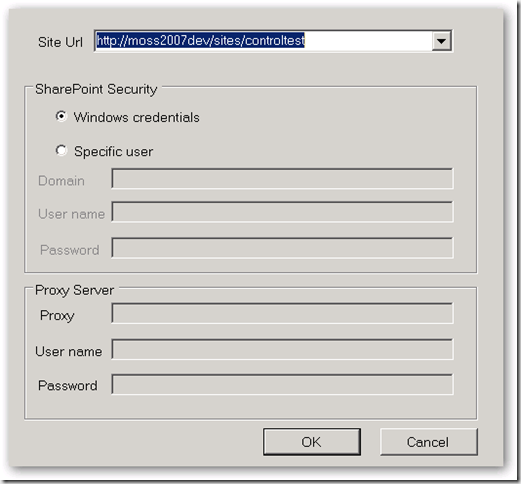 While developing a powerful new feature for SharePoint Publishing sites I had to deploy a HttpModule "the SharePoint" way. Building a HttpModule , a corresponding feature and the resulting WSP package is easy with our Macaw Solutions Factory. The actual logic in the Http Module and the feature is the difficult part. One of the things I had to do was to create a feature that registers a HTTPModule on feature activation, and removes it from the web.config on the feature deactivation. You can do this using the SPWebConfigModification class. A good article on this topic is http://www.crsw.com/mark/Lists/Posts/Post.aspx?ID=32. It contains links to other posts as well. The Microsoft documentation can be found at SPWebConfigModification Class (Microsoft.SharePoint.Administration), I wished I scrolled down before, because a lot of valuable information can be found in the Community Content of this page (keep scrolling!). Anyway, it took quite some time to get my HttpModule to register/unregister correctly on activation/deactivation of my web application level feature. I post the code below so you have a head-start if you have to do something similar yourself. // are added based on the value of the key attribute in alphabetic order. // PublishingHttpModule, we prefix the name with 'Q-'. Value = "<add name='Q-Macaw.WcmRia.Moss2007.DualLayout' type='Macaw.WcmRia.Moss2007.DualLayout.Business.Components.HttpModule, Macaw.WcmRia.Moss2007.DualLayout.Business.Components, Version=1.0.0.0, Culture=neutral, PublicKeyToken=077f92bbf864a536' />"
SharePoint WCM does a lot of caching. One of the things that is cached are the publishing pages. These pages are cached in the object cache. Sometimes there is a situation where you want to flush a publishing page from the cache. In my case I had to flush a publishing page from the cache in a http module. The cache id for this page is the server relative url without any characters after the url. For example: /Pages/MyFirstLittleWCMPage.aspx. Therefore the path must be "normalized" so additional "stuff" is removed. The NormalizeUrl() function does this job. Sadly enough many interesting and powerful API classes are internal, and you need some reflection to be able to call them. Below the code I needed to write to accomplish the above. I can tell you it was a hell of a job to get to this code. That is why I share it, to give you some insight in the required magic called reflection. I know that the assembly containing the required class is already loaded. I can do GetAssembly(typeof(PublishingPage)) to get the assembly. Will work on any class in the assembly. To invoke a member of a class you need the type of the class. Assembly.GetType("full.name.of.type") returns the type, also on internal classes. Given the type you can invoke members, where members can be static functions, properties or methods. You specify what to search for the member using BindingFlags. For example for a static public method specify BindingFlags.Static | BindingFlags.Public | BindingFlags.InvokeMethod. Arguments to methods must be passed in an object array. I hope the code below will give some insight in how to make the impossible possible. Debugging SharePoint/ASP.NET code? Smart key-codes + disable timeout! 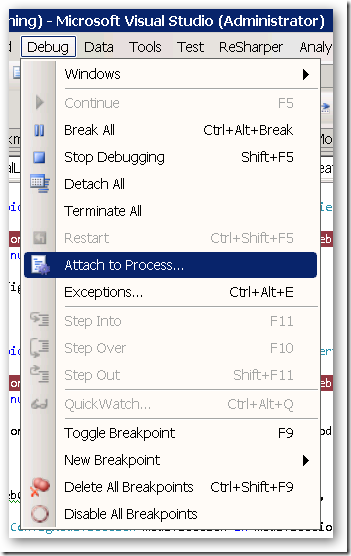 I'm currently running around in the Visual Studio debugger to debug some complex SharePoint code. There are two things really annoy me: all the mouse-clicks needed to attach to the Internet Information Server process and the time-out you get when you are exploring complex data-structures for too long. The list of available processes is already active. We nog need to select the Internet Information Server worker process. Each application pool has it's own worker process. 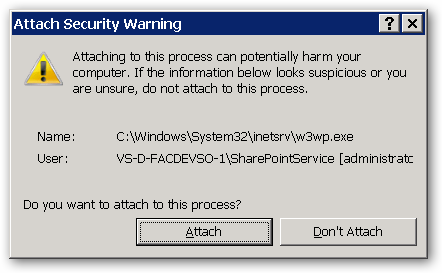 These worker processes are named: w3wp.exe. The "Attach" button is selected by default. This brings us to the latest <ENTER> to accept the default selection. We are now attached to the correct Internet Information Server working process(es) and can start debugging. You have got a "ping" timeout. If you read the box well, it tells you exactly what happened, and it tells you to press the "Help" button for further details. To continue to debug, you must configure IIS to allow the worker process to continue. 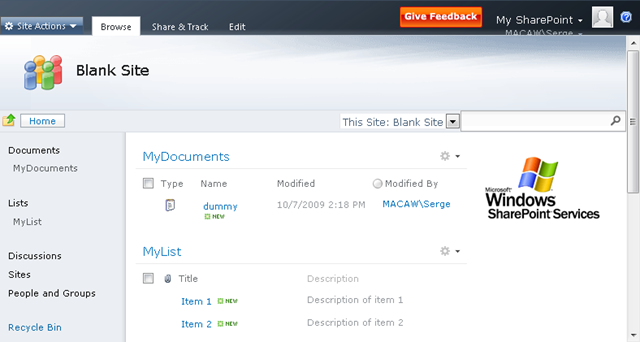 In Control Panel, choose Switch to Classic View, if necessary, and then double-click Administrative Tools. 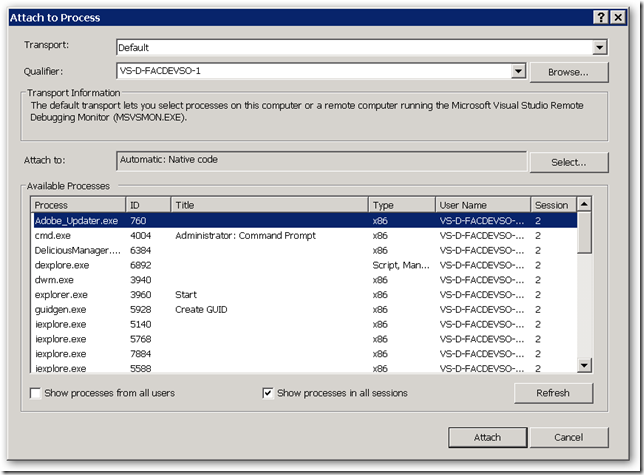 In the Internet Information Services (IIS) Manager window, expand the <computer name> node. Under the <computer name> node, right-click Application Pools. 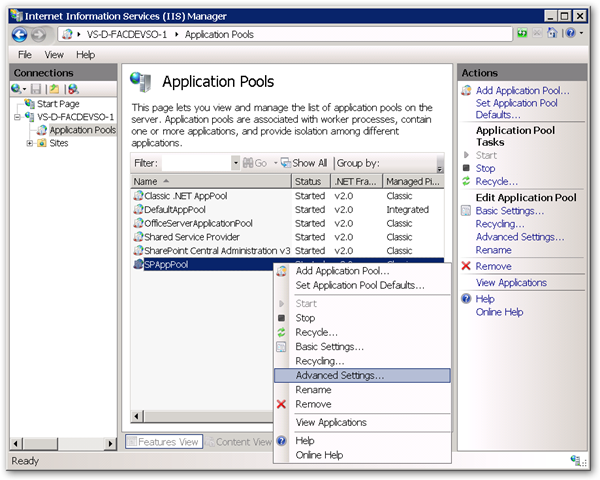 In the Application Pools list, right-click the name of the pool your application runs in, and then click Advanced Settings. Set Ping Enabled to False. Set Ping Maximum Response Time to a value greater than 90 seconds. Setting Ping Enabled to False stops IIS from checking whether the worker process is still running and keeps the worker process alive until you stop your debugged process. 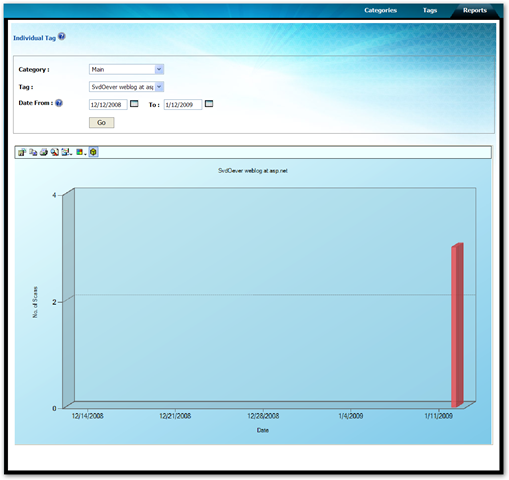 Setting Ping Maximum Response Time to a large value allows IIS to continue monitoring the worker process. Under Services and Applications, click Services. -- Don't know what the rest of the steps if for... you are done! A list of services appears in the right-side pane. In the Services list, right-click Terminal Services, and then click Properties. In the Terminal Services Properties window, locate the General tab and set Startup type to Manual. 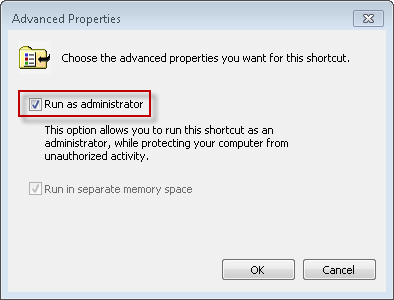 Close the Internet Information Services (IIS) Manager window and the Administrative Tools window. Set "Ping Enabled" to False, press OK, and you can drill through your data-structures in the debugger for as long as you want! See http://weblogs.asp.net/soever/archive/tags/SPDevExplorer/default.aspx for all myposts on SPDevExplorer. - Changed "Published by VS 2005" and Checked in by VS 2005" to "Published by SPDevExplorer" and Checked in by SPDevExplorer"
because add-in works with both VS 2005 and VS 2008.
test on overwrite of modified files. 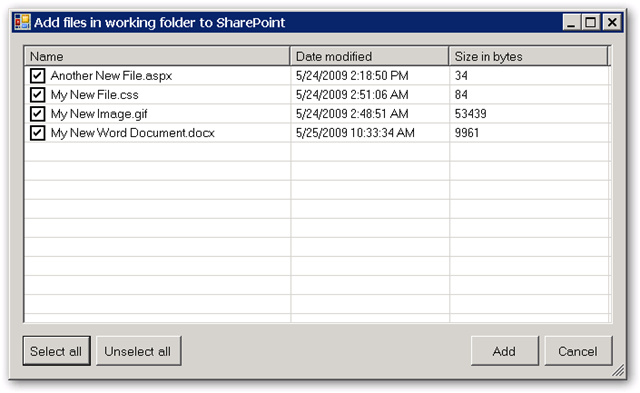 the working folder and saved back to SharePoint. 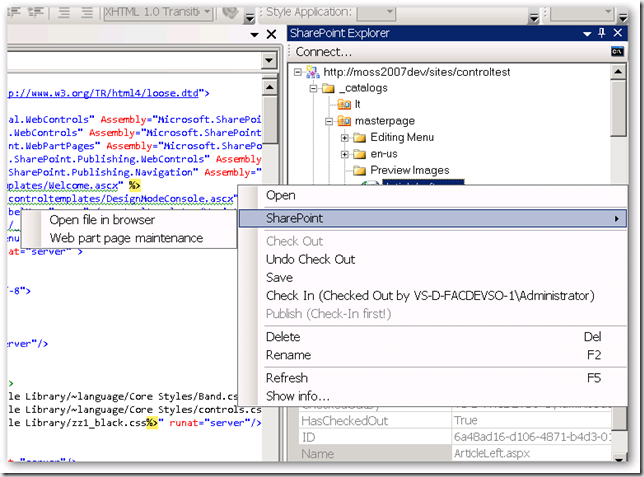 and add them to SharePoint using Visual Studio. - Added "Explorer working folder..." to all folders, not only to site. Makes it easier to add new files. 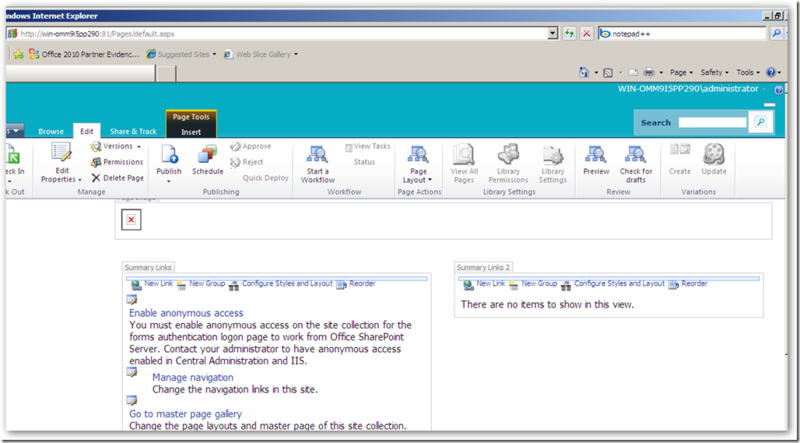 - Added "SharePoint->Open site in browser", "SharePoint->Open folder in browser", "SharePoint->Open file in browser"
- Fixed a bug where subnodes where not rendered when enabling/disabling "Show all folders and files"
- Removed SharePoint Settings and SharePoint COntents options on folders. Gave a "Not implemented"
- Generated a strong key for the SPDevExplorer.Solution project. I got an error when installing the WSP rthat assembly was not strong-signed. - Several changes to make sure that https is supported by changing the UI that full path is shown in tree. You now see https://mysite instead of just mysite. this into a feature to add files to the cache folders and be able to add these additional files. using "connect...". I think it is also better this way. Note that the download version is named version 2.3, but internally this is version 2.2. I messed up with the numbering. I did a lot of additional bugfixing and enhancements on SPDevExplorer. Resulted in version 2.1 of SPDevExplorer. Download bin + sources at http://spdevexplorer.codeplex.com/WorkItem/View.aspx?WorkItemId=7799. Let me know if you find any issues. - Fixed a bug where subnodes were not rendered when enabling/disabling "Show all folders and files"
I recorded a video on installing and using the SharePoint Developer Explorer. See my first post for information on location for download and last changes. If the video below does not show follow this link to the video file. 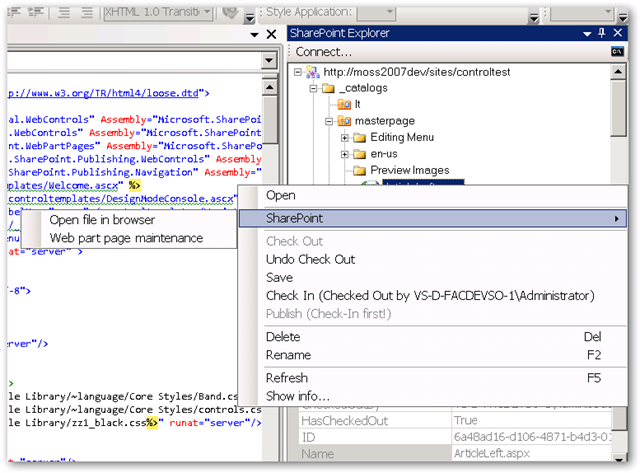 There is a great project http://SPDevExplorer.codeplex.com by TheKid that allows you to edit SharePoint content from within Visual studio. 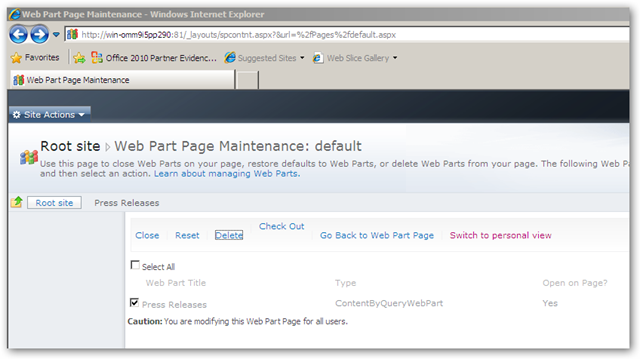 This is especially handy when creating SharePoint Publishing sites where you are editing master pages and page layouts. Most people do this in SharePoint designer, hating the fact that SharePoint Designer messes with your code and sometimes locks files mysteriously. 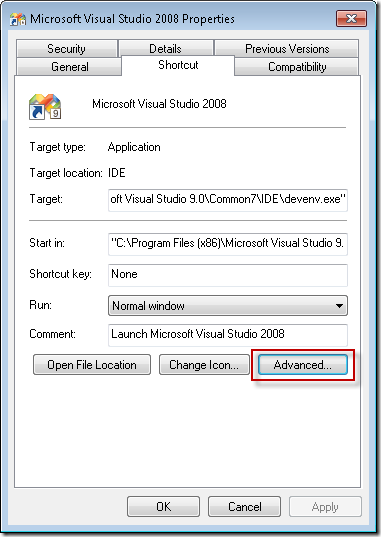 SPDevExplorer allows you to do this using Visual Studio using the great Visual Studio editor. The release on codeplex is a bit old and had some issues so I decided to dive into the code and solve some issues. I published my first updated version as an Issue on the project, because that allowed me to add attachments. 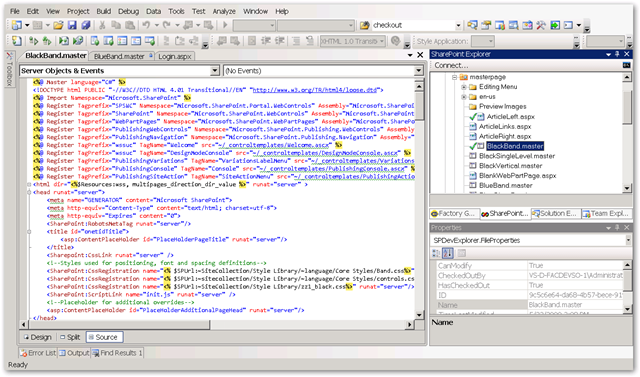 See http://spdevexplorer.codeplex.com/WorkItem/View.aspx?WorkItemId=7799 for the updated version. Both binaries and source code included. Generated a strong key for the SPDevExplorer.Solution project. I got an error when installing the WSP rthat assembly was not strong-signed. Added "Explore working folder..." on site, so the cache on the local file system can be found. Want to turn this into a feature to add files to the cache folders and be able to add these additional files. Removed adding list of webs to a site, gave an error and sites were never added. All sites must be added explicitly using "connect...". I think it is also better this way. In a next post I will show some of the features of this great tool (video). Note that it is not possible edit the web parts in web part pages with this tool (web parts are not part of the page), and that it is not possible to edit pages in the Pages document library, the actual content is managed in the meta data of the connected content type. LiveWriter finally working again with my weblogs.asp.net blog! Thanks to Joe Cheng who was so kind to respond to my previous post on the topic I finally have LiveWriter working again against my blog. In the past this was: http://weblogs.asp.net/blogs/metablog.ashx, and it was changed without notification! At least I didn’t receive one! Joe, thanks again! Time to get blogging again! PowerShell has a special [ref] keyword to specify which parameters are used in a fuction to return values. It's usage is not directly clear however. If the type of the variable to update is a value type, use the [ref] keyword in the declaration of the function parameter, this specifies that a "pointer" to the variable will be passed. To pass the "pointer" to the variable, use ([ref]$variable) to create the pointer, and pass this as parameter. To set the value of the value variable pointed to by the "pointer", use the .Value field. C:\Program Files\PowerGUI> $zz = "hoi"
C:\Program Files\PowerGUI> $xz.Value = "dag"
This is only required for value types, not is the type is a referece type like for example Hashtable. $arg3.key = "overwrite hash value"
Yesterday evening I gave a presentation on the Business Productivity Online Suite (BPOS) for the DIWUG. The session was hosted by Sparked in Amsterdam. I uploaded the presentation at my skydrive. The presentation starts with a general introduction to BPOS. 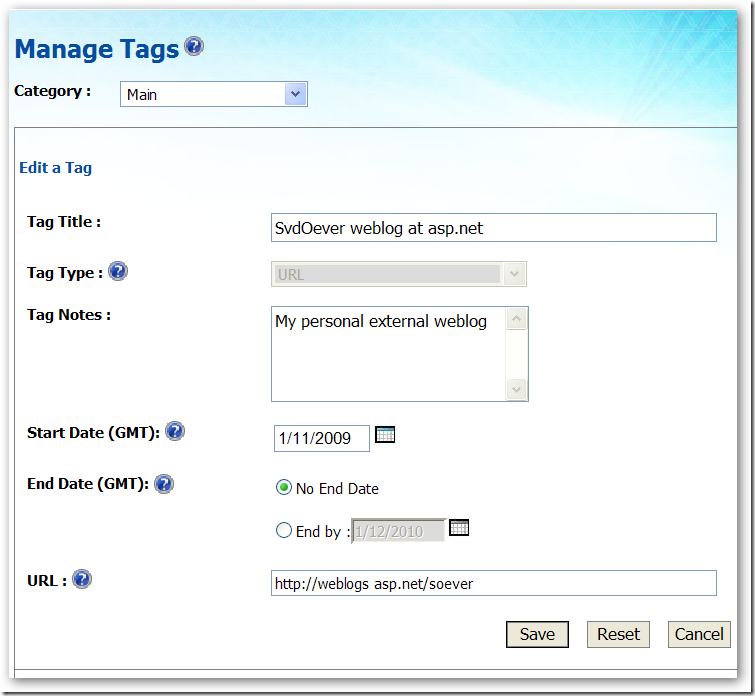 It then zooms in on the features of SharePoint Online and gives some ideas on how you could integrate Silverlight applications with BPOS. Part of the presentation is in Dutch, but I think most of the presentation can be understood by English readers as well because most computer related terms are in English. The Macaw Solutions Factory contains a lot of PowerShell script code. A lot of the code is documented, but it is not documented in a consistent way because there were no documentation standards available for PowerShell 1.0, we only had the very complex XML based MAML documentation standard that was not useable for inline documentation. With the (upcoming) introduction of PowerShell 2.0, a new more readable documentation standard for PowerShell code is introduced. I did not find any formal documentation on it, only examples on the PowerShell team blog. There is even a script to create a weblog post out of a script containing this documentation format. See http://blogs.msdn.com/powershell/archive/tags/Write-CommandBlogPost/default.aspx for this script and an example of the documentation format. This will allows us to change the documentation by removing the superfluous # characters when the code-base is moved over to PowerShell 2.0 when it is released. The next step is to automatically generate documentation on all our scripts based on the new documentation format. The best approach will possibly be to use PowerShell 2.0 to actually generate the documentation, because using PowerShell 2.0 we can parse PowerShell code. We can easily determine the functions and their parameters. A nice project for the future. Microsoft Tag, funny idea, will it take off? I snapped a photo from the on screen PDF file, allowing the iPhone to access my location information (smart), and..... nothing. I got an error. I was a bit disappointed so i fired up the introductory movie on http://www.microsoft.com/tag, snapped a really bad photo from a tag in this movie and guess what! It worked! It brought me to a Vista advertisement. I think the idea is good. This can be used very well for print on posters, advertisement, the price and information cards next to a TV in a shop etc. etc. The introductory movie gives some good examples like an advertisement for a concert with a Tag that brings you to the booking page, or at a bus station where the Tag brings you to an online schedule of the bus. Wondering if this will take of. And hey, I got three hits!! So the Tag was recognized, just the linking failed! The Tag picture above should point to my weblog, maybe it will start working in a while. Try it all out, and I will let you know about the results in a later blog post. It would be really interesting if the report would also use the location information that can be provided by the Tag Reader application (the iPhone version does if you allow this), so you know where your Tag was snapped. When developing for SharePoint you absolutely need a SharePoint inspection tool, a tool that can navigate through the SharePoint object model and SharePoint content. "This powerful free tool will allow you to spy into the internal data of SharePoint and compare the effects of making a change. 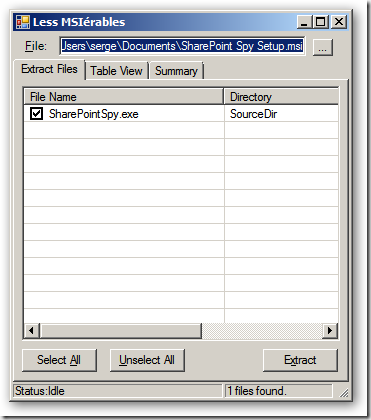 Sharepoint Spy also allows you to compare settings between sites, lists, views, etc helping you troubleshoot configurations." You need to register and will get an e-mail with download details and a registration key. 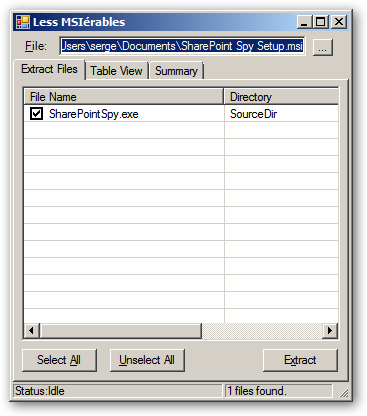 After extracting the SharePointSpy.exe file you can just run it on Windows Server 2008. 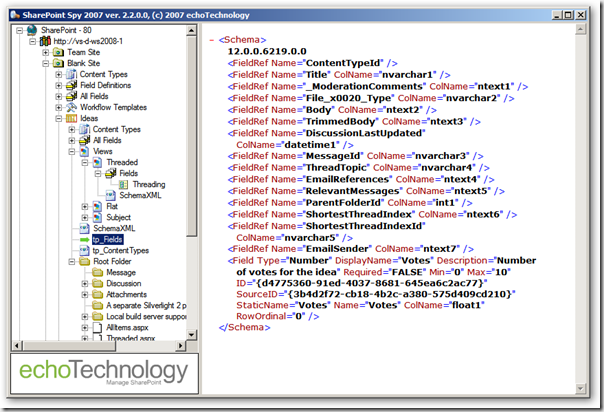 Show the schema of a view, right-click on right window (Internet Explorer window) and select View Source to see the actual xml in Notepad. You can compare any two object by right-clicking an object and select "Compare this object with...", then select a second object and select "... compare with this item".